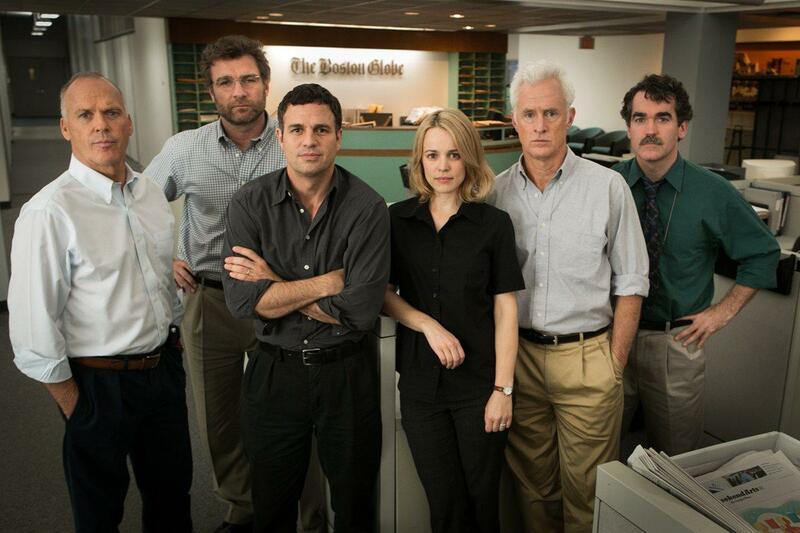 It’s movies like Spotlight that make me wish the Academy Awards had a Best Ensemble award because every single player in this journalism expose film is about as good as it gets. This whole movie is without a doubt one of the best of the year and I really think it is an important movie for all to see. 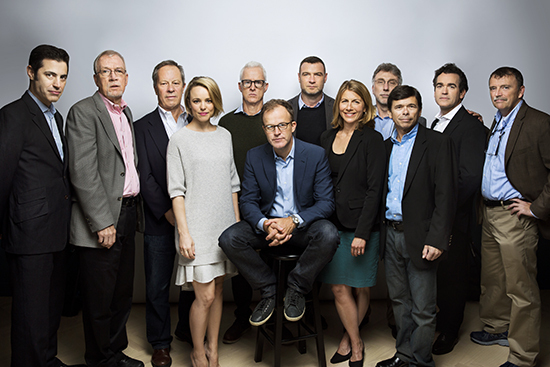 Spotlight is based on the 2001-2002 investigative journalism done by a wing of the Boston Globe called spotlight. They spent nearly 2 years researching abuse in the Catholic Church and by the end uncover 70 predators and the widespread cover-up that allowed this evil to persist. But that might make it sound depressing and it is certainly sobering but I was surprised how many times I smiled. The script is so well written and the performances so great that it feels like we are following real people who of course are going to smile and laugh on occasion even when investigating this awful thing. It will also rip your heart out at sections but that is again because the writing allows for the softer moments and gives us a chance to breathe and take it all in. There is never a sense of being manipulated because some of the characters even realize their lack of reporting in the past was part of the problem. It is not like Steve Jobs which was good but left me feeling cold because it was so one-sided. Here are fully dimensional people investigating lead after lead after lead. If Tom McCarthy and Josh Singer don’t get nominated for Best Screenplay than it would be the scandal of the year. These reporters and most of the other characters were so compelling I felt like we had been through an experience together and I knew them after watching the movie. It was that natural and real. I love movies about work and this is an amazing one. You could feel the hard work weighing down their faces but their drive and ambition, even arrogance also feeding in. Mark Ruffalo- as Michael Rezendes, one of the main investigators, amazing performance and a scene where he talks about how much he used to like going to church made me sob. 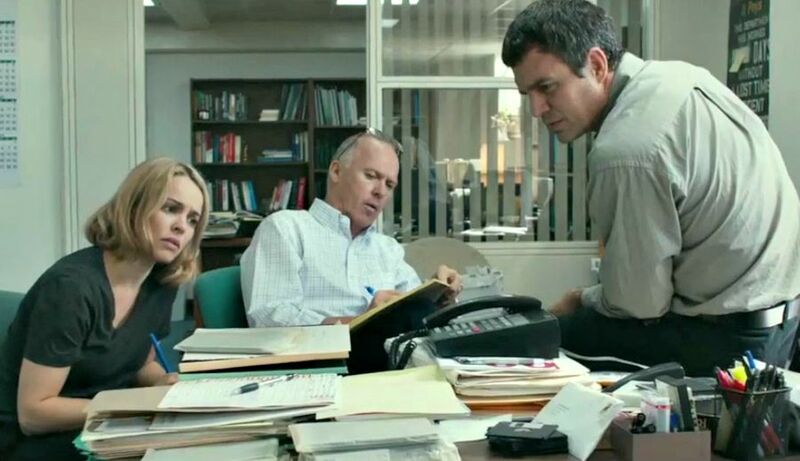 Rachel McAdams- as Sacha Pfeiffer, the lone woman in the Spotlight crew who goes to church with her Nana and makes a personal investment in interviewing and getting to know many of the victims. 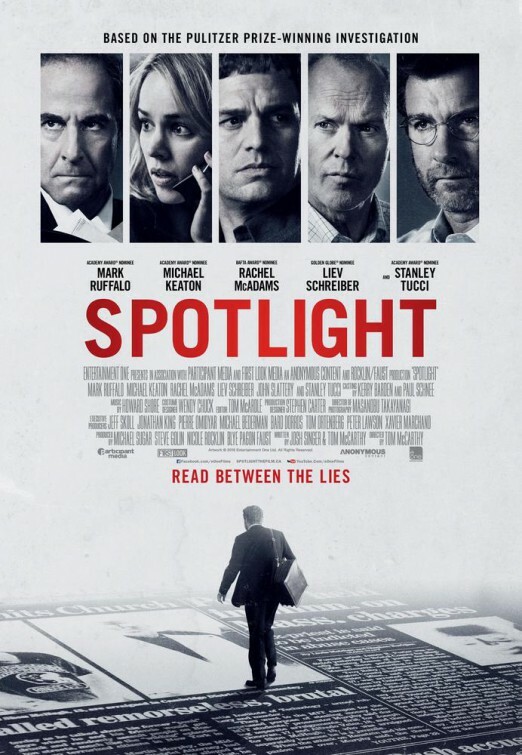 Michael Keaton- as Robby Robinson, head of Spotlight who is a great leader and uses his ins within the Boston community to uncover many things he wish he didn’t have to know about or find. 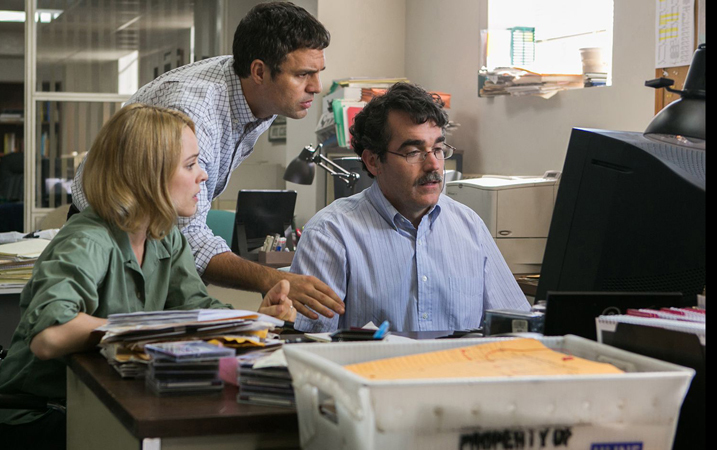 Liev Schreiber- as Marty Baron, new editor for the Globe and pushes the Spotlight team on the case. He is Jewish and there is a feeling he is trying to use this case to make a big name for himself, which may be partly true. It’s a brilliant performance. John Slattery (from Mad Men)- Ben Bradlee Jr, one of the heads at the newspaper. Stanley Tucci- as Mitch Garabedian is nomination worthy as a lawyer who takes on these long shot victims cases. Initially you think he is out for only the notoriety of suing the Catholic church but there is more to it. The list could go on and on. It’s truly remarkable how these reporters felt like real people and I was completely engaged as they dug one level and then another and another. To hear how men supposedly of God could rationalize and make excuses for molesting and harming children is sickening. I don’t know how that can not be the case. But it is also sickening to hear about people who could have done something to stop it and kept their mouth shut, or in some case silenced those who were willing to speak out. That is not what Jesus would have us do. He protected the little children above everything else. He blessed them and brought one back from the dead. Yes, he forgave the woman caught in adultery but that was only after she faced near death as a punishment. He showed mercy but he did not for a second turn a blind eye to sin especially when it came to children. Watching something like Spotlight it does tear your heart out and make you think about what you would do. We all like to think we would do the right thing but an entire city for decades didn’t and that is a sobering thought. It took the brave efforts of these reporters to finally get something done. They are true heroes in my book. Here’s some of the actors and the actual reporters. But I can’t overstate it enough this is a sobering but not depressing film. 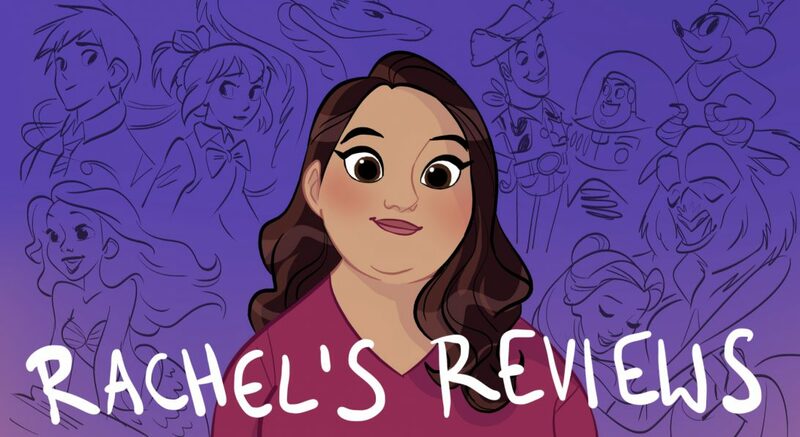 I left feeling inspired, wanting to make a difference in the world, wanting to be a better person, and I really did laugh more than you’d think. It’s a great movie and I loved it so much. As far as content surprisingly it is a very mild R rating. There’s a little bit of language and some scenes where molestation is discussed openly but it’s minimal and I think definitely appropriate for mature teens. Go see it! Just thought I would share this review with you guys for the film Spotlight. It is truly one of the best of the year and I can’t recommend it more highly. Thanks! It should definitely be all over the Oscars this year and it is deserved. I didn’t mention the cinematography but it is good also. It feels like a small town even though it is a city like Boston. I look forward to hearing what you think when you get a chance to see it. I really want to see this film; it looks well-made and can see a Best Picture nomination for it! And yeah, I’m not going to demonize the Catholic Church because of this incident that happened, but it would be interesting to know how they feel about this film. I think you will really appreciate it. I agree on Catholic Church. These incidents do not speak for the church or a majority of its members. But I agree it would be interesting to hear their perspective on the film though. I feel like the film is not anti-Catholic or anti-religion. It is more about how an entire city can cause these kinds of things to happen. More about the downside of group thought. Even the reporters are not without fault you will find. Yeah, I know some reporters do that kind of thing with the intention of just defaming the one they’re researching instead of actually caring about justice being done; they use justice as a mask to their real intentions. I’m glad it’s not a hard R film.